Union Industries is the trading title of Ralph Ellerker (1795) Ltd. We are quite possibly the best bespoke Manufacturing Company in the world. We believe in exceeding normal expectations of Quality & Service. For more background on the company, visit our history page. We are based in a fabulous factory in Leeds, Yorkshire England where old meets new in the fusion of Union’s charming old manufacturing workshops and office that houses the latest in 21st century technology, equipment and design expertise. Get Directions to our office. Our customers, benefit from a highly trained, skilled and long standing workforce. The result – Union produce products of truly enviable quality and with a service back-up second to none. We are the best because of the excellence of the people we employ. See Testimonials from our Customers. Eiger Door is the latest addition to the Union Industries range and is the first automatic fast acting Freezer Door invented to operate reliably at high speed, thus eliminating frost and ice on the door blade and around the freezer opening. 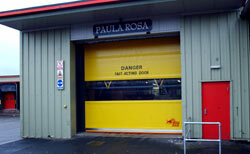 Ramdoor – the rugged external rapid roller door with Crash Out Facility, counterweight assisted opening and heavy duty Ramhide door blade. 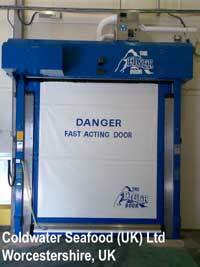 the dual purpose external or internal rapid roll Hi-speed door with Crash Protection and Blade Auto-reset. Designed to fit in average sized external openings where moderate wind speeds prevail, to reduce heat loss, resulting in energy savings. Or in larger internal openings or where internal openings are subject tonegative or positive pressures, in pharmaceutical environments, for example. Matadoor for internal openings, ideally suited for high volume traffic. 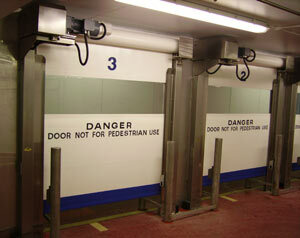 Matadoor™ has both Crash Out and Auto-rest to protect the door and blade from damage by speeding forklift trucks. A small, neat, lightweight rapid roll door with photocell protection for internal openings for conveyor, personnel, In-store use and ideal for ambient and chilled environments.